Expansion of transnational capital and mass media to even the remotest of places has provoked a spate of discourse on transnationalism. A core theme hi this debate is the penetration of national cultures and political systems by global and local driving forces. The nation-state is seen as weakened by transnational capital, global media, and emergent supranational political institutions. It also faces the decentering local resistances of the informal economy, ethnic nationalism, and grass-roots activism. 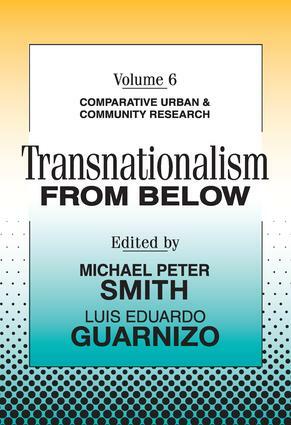 Transnationalism From Below brings together a rich combination of theoretical and grounded studies of transnational processes and practices, discussing both their positive and negative aspects. The editors examine the scope and limits of transnationalism. The volume is divided into four parts: "Theorizing Transnationalism"; "Transnational Economic and Political Agency"; "Constructing Transnational Localities"; and "Transnational Practices and Cultural Reinscription." Contriburtors include Andre C. Drainville, Josephine Smart, Alan Smart, Minna Nyberg S0rensen, George Fouron, Nina Glick Schiller, Luin Goldring, Sarah J. Mahler, Linda Miller Matthei, Louisa Schein, David A. Smith, and Robert C. Smith. Moving easily between micro and macro analyses, this book expands the boundaries of the current scholarship on transnationalism, locates new forms of transnational agency, and poses provocative questions that challenge prevailing interpretations of globalization. Transnationalism From Below is a pioneering collection that will make a significant addition to the libraries of anthropologists, sociologists, international relations specialists, urban planners, political scientists, and policymakers.